5 taste uttappam as the name goes is different and interesting recipe that serves 5 uthappams in different tastes with different variety of side dishes. 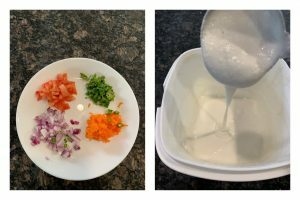 Yes this breakfast dish is usually served in restaurants in chennai and I wanted to try it for the longest time and I am glad I tried it and sharing with you guys. So what do I have on my plate? Super easy to make and tastes super yummy too, as all the uthappam needs just one batter and just little chopping work can create these beauties in your kitchen too. If you have idli batter at home that too fresh batter makes soft and fluffy uthappam. I served this as breakfast on weekend that’s why I was able to make many side dishes. 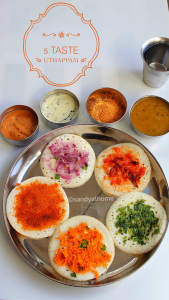 I served the uthappam with tiffin sambar, coconut chutney, onion tomato chutney and idli podi. You can serve it with just one dish too since it was weekend I made it. So lets get to the making! Chop all the veggies finely and keep it aside. Make sure the batter is thick and dense to yield soft and fluffy uthappam. Now heat a tawa and pour few ladles of batter to make 3 small size uthapam that can accommodate in a tawa. Now add chopped onions in one uthapam/ Indian pancake, chopped tomato in another uttapam/ pancake and chopped cilantro in the 3 rd/ last uthapam. Drizzle few drops of oil/ ghee around each uttapam. 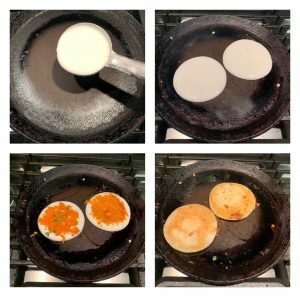 When you see browning in the sides flip the uttapam gently and let it cook in medium flame. When done transfer it gently to a plate. Now pour few ladles of batter to make 2 small size uttapam again that can accommodate in a tawa. 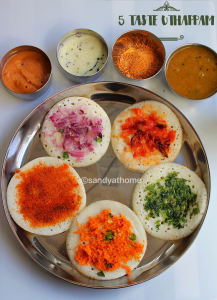 Now add chopped chili and grated carrot in one uttapam and sprinkle idli podi in the last uttapam. and cilantro as topping. Drizzle oil/ ghee around it. 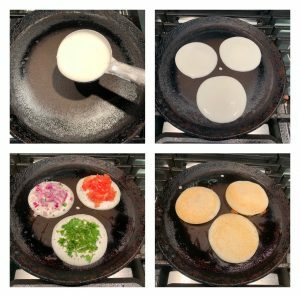 When you see browning in the sides flip the uttapam carefully. Cook until done. Serve it hot with chutney or sambar! Chop all the veggies an d keep it aside. Make the uthappm batter ready. The batter should be thick and dense. 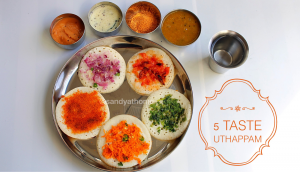 Now heat a tawa and pour few ladles of batter to make 3 small size uttapam that can accommodate in a tawa. Now add chopped onions in one uthappam/ indian pancake, chopped tomato in another uttapam/ pancake and chopped cilantro in the 3 rd/ last uttapam. Drizzle few drops of oil/ ghee around each uttapam. When you see browning in the sides flip the uttapam gently and let it cook in medium flame. When done transfer it gently to a plate.